The key to successfully stopping mold growth is to control its food source or source of moisture. Building with mold resistant materials is becoming more and more common, and we applaud those in the building industry who have attempted to create wallboards and other building materials that are not mold friendly. It is more costly to create these materials and install them into buildings and homes. However, anyone who goes to the effort and expense of building with superior materials will be saving themselves and their clients a great deal of problems and expense in the future. Unfortunately, for most of us we do not have the option of building a home or office the way we want. We are stuck with what we’ve got and at least for now the common mentality is the cheaper the better when it comes to building. Even if you have a very mold friendly wallboard with paper facing hanging all over your walls, wallpaper, and wall to wall carpeting, you can still avoid extensive mold growth. The key is to control the amount of moisture that is coming through your walls, up through your floors, down from your roof, or in the form of humidity and condensation. 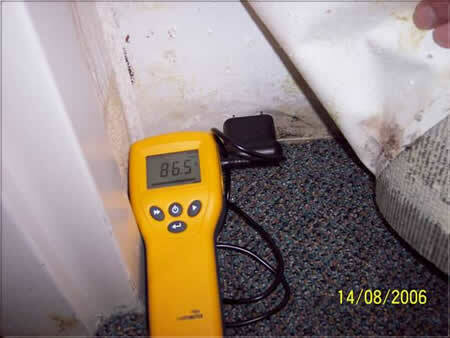 At Oasis Indoor Environmental Inc. we fully understand how much moisture it takes to allow for mold growth. We bring our knowledge, experience and the necessary tools to your home or office to help you find the source of the problem. Some molds require very little water activity to begin growing, smelling, and giving off spores. We can assess your environmental conditions and inspect your climate control systems (HVAC, Air Conditioning) to determine that they are functioning and not actually hindering indoor air quality. Leaks can come from a number of different sources. Roofs leak, plumbing leaks, and window leaks are the most common. However, there are many cases of water intrusion (leaks) as a result of poor exterior maintenance or poor stucco and EIFS workmanship. In addition, leaks are very hard to trace. 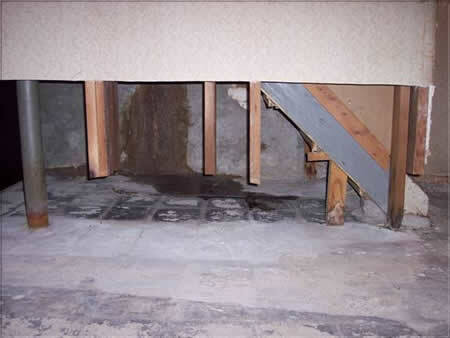 You may find water leaking through the base of your wall in the living room that originated 50 feet away in the roof. We have the instruments and expertise to track down these leaks and find their source. Water has the ability to wick through any porous material. This is accomplished by means of a strong physical force called capillary action. It’s this same force that allows water to reach the highest branches of a 300 foot Sequoia Redwood. When vapor barriers and capillary breaks are not installed correctly or compromised, then this very strong natural force can allow ground water to come straight into your living space. This ground moisture can ruin carpeting, discolor grout lines, and cause extensive mold growth. 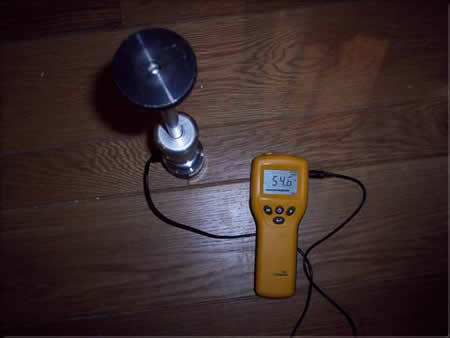 We employ state of the art instrumentation and techniques to measure how wet your flooring is and determine the necessary steps to mitigate this intrusion. If you’ve had a flood, even if it was only a small amount of carpeting that got wet, you must get it dried appropriately. If there is a delay in the drying process or it is not done correctly and sufficiently, then serious molds can begin to grow. We encourage you to hire a professional building drying contractor certified by the IICRC (Institute of Inspection Cleaning and Restoration Certification) or similarly reputable organization. When the drying is being accomplished we can provide third-party monitoring of the drying to assure that it is being done correctly, completely, and that you are not being overcharged for unnecessary time or equipment. 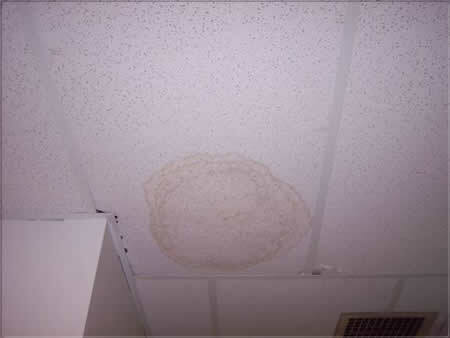 Do you have ceiling tiles that look like this? Does this mean mold? Is this all that’s affected? Our comprehensive assessment using proper instrumentation will provide you the answers. This Flooring is wet. However, the top layers looked dry and read DRY. Standard moisture measuring will not reveal trapped moisture in the sub flooring. We provide a thorough assessment using the right tools and our experience to give you a true picture of what’s going on. Trapped moisture can and did cause extensive mold growth. In this case the sub flooring had to be removed. Pulling away carpet base and vinyl wall paper revealed a very wet wall. With moisture comes mold (as is already becoming evident). If not handled properly, simply tearing out the sheetrock can cause a small problem to become much bigger, and put occupant’s health at serious risk. On initial inspection our moisture meters picked up a WET wall. Our report and Action Plan outlined exactly how this area was to be remediated. Once the work was completed, the source of the moisture intrusion was fixed. This is a good example of how a chronic problem was fixed, and why just “painting over” or “using bleach” on mold is not always the answer.